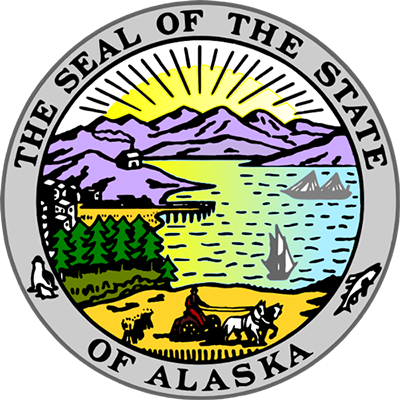 STATE MOTTO: The United States purchased Alaska from Russia in 1867. In 1963, the Alaska Centennial Commission was organizing for the celebration of the event in 1967. In preparation, they sponsored a contest to come up with a centennial motto that would express the quality of the state. They offered a $400.00 prize to the winning entry. In December 1963, the commission announced that they had selected Juneau newsman Richard Peter's suggestion, North to the Future The motto represents a forward-looking optimism, a state of promise. Richard Peter is quoted that the motto "...is a reminder that beyond the horizon of urban clutter there is a Great Land beneath our flag that can provide a new tomorrow for this century's 'huddled masses yearning to be free.' "
The Alaska Legislature adopted North to the Future as the official motto of Alaska in 1967, during Alaska's Purchase Centennial. STATE GOVERNMENT: Alaskans elect a governor and a lieutenant governor to four-year terms. The governor, who appoints the heads of all state departments and many other officials, is considered one of the most powerful governors in the United States. The Alaska State Legislature includes a Senate and House of Representatives. 40 representatives serve in the Alaska House of Representatives. 20 senators serve in the Alaska Senate. Two basic forms of local government exist in Alaska: the city and the borough. The borough is similar to the areas referred to as counties in most other states. 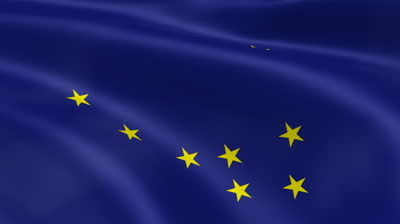 Alaska is unique, among the states, because most of it has not yet been organized into political units such as boroughs or cities.